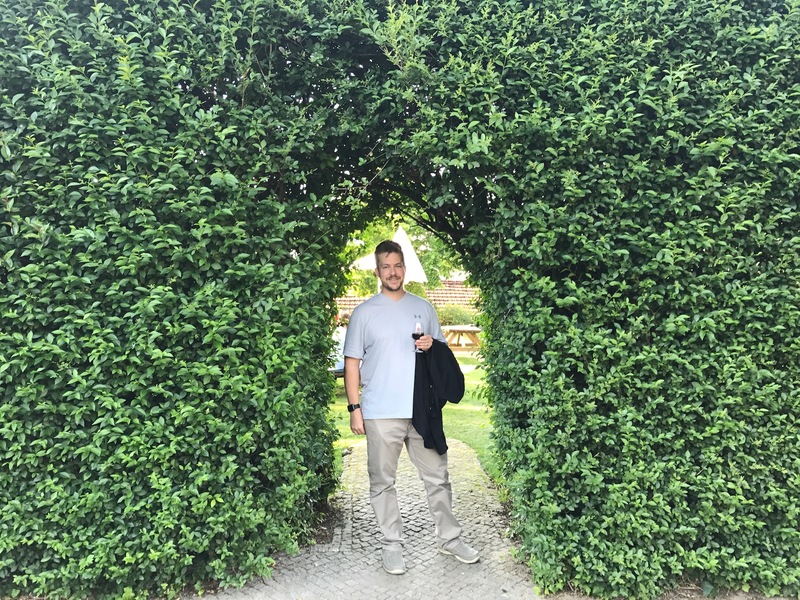 Our trip to Porto, the second-largest city in Portugal, spanned just three days, but we managed to indulge in enough wine and port tasting to vastly increase our knowledge of Portuguese grapes and the sometimes earthy, sometimes extravagant, but always surprising liquids derived from them. Our first afternoon in the city, a sunny and dry Friday, we discovered the Instituto do Vinho do Porto (the Wine Institute of Porto). 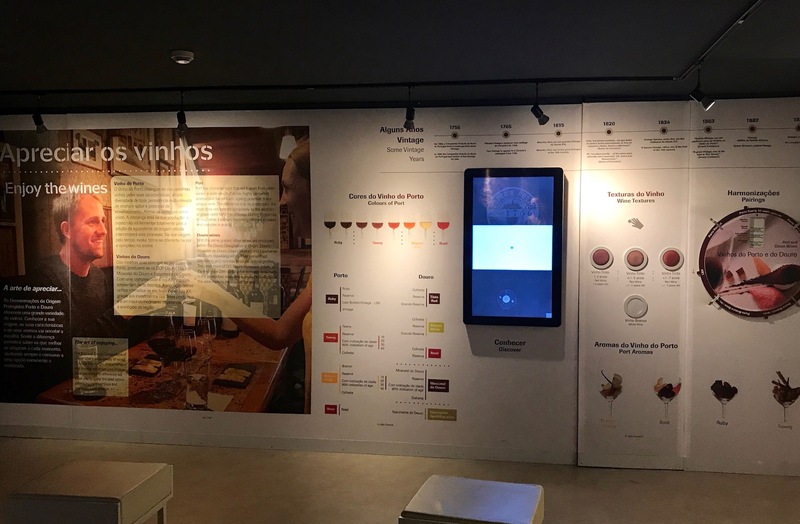 * Housed in a nondescript, neoclassical building, its bright, whitewashed walls highlighted photogenic displays of the history of port and its aging methods, shelves lined with bottles for sale, and a self-tasting area comprised of a small fridge containing bottles of port connected to taps. 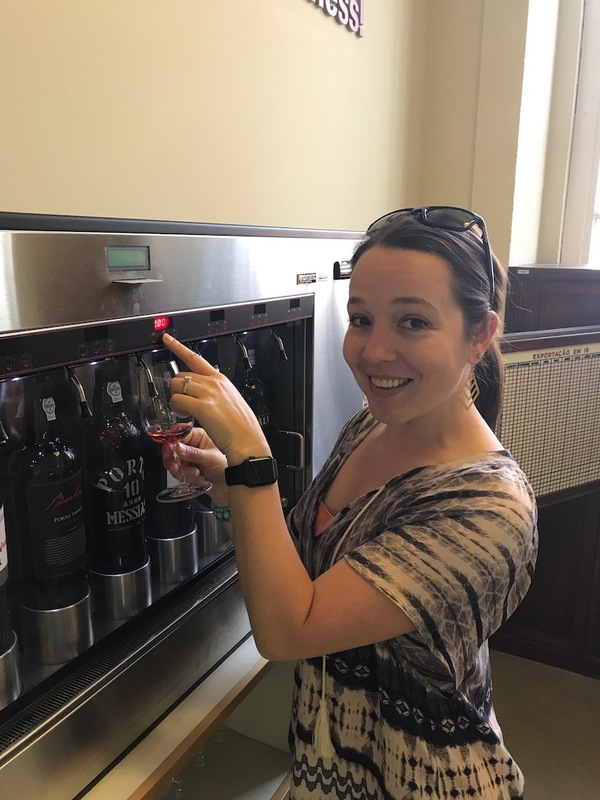 We took advantage of the opportunity to sample some very affordable (and a couple not-so-affordable) wines while deciphering a well-made educational video in Spanish (then in Portuguese). We became intrigued by a relatively new phenomenon in the world of port: rosé or pink port. We asked an employee (who had been boxing and stocking port in a back room with an air of subtle yet commanding importance) what he thought about this newcomer. He wrinkled his nose slightly, called it “swimming pool port,” but offered to let us try some from a bottle he had in the back. Let me say this: pink port is delightfully floral, light and rosy, with hints of acidity and strawberries. Perfect for the pool, indeed! It might be difficult to remember, but Portugal does not only produce delightful portos (what the Portuguese call port wines) – the unfortified wines are popular, approachable and fairly widely distributed as well. 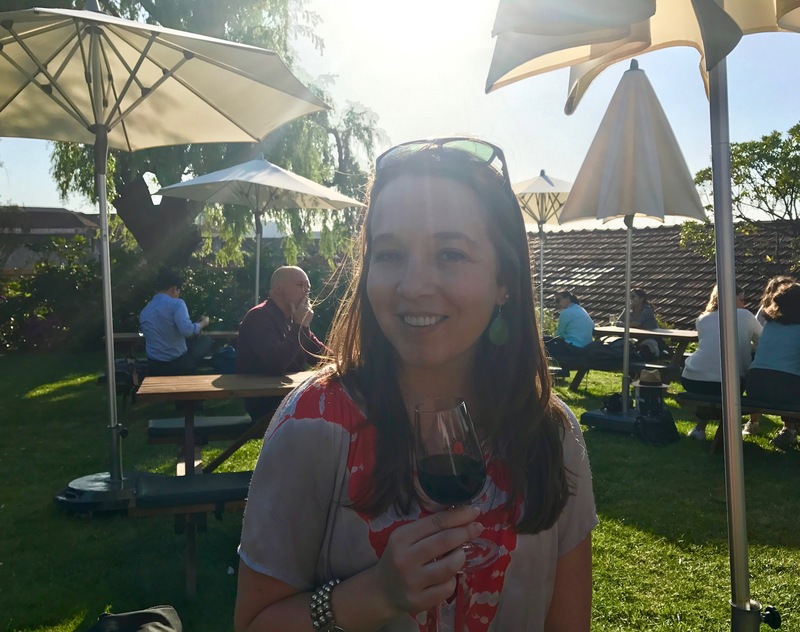 An event on a side street caught our eye on Friday afternoon, post-Institute tasting: there was a sign for “free entry” and something about wines from the north-central Dão region of the country – clearly, we had to check it out. A naturally lit, two-storied atrium was crowded (on both levels) with Dão wineries pouring their most popular wines atop crisp, white linen-covered tables. With the purchase of a 3 euro glass, attendees could sample as many wines as they wished within a 5-hour period; we were sold. Eager to learn more about Portuguese wine, we circled the lower level, then the upper, and spoke at length with each of the vintners and producers whose wines we tasted. Each participant was happy to chat with us and educate us about his or her wines, and they were all enthusiastic, loquacious, polite and generous with their pours. We learned a great deal about touriga nacional, one of the most popular grapes in Portugal, and discovered that it is deliciously spicy, dark, fruity and bold. Another pleasant treasure uncovered: Portuguese rosés and their fresh, crisp, strawberry and peach notes. Several hours of tasting and chatting our way through the wines of the Dão region nearly knocked us on our butts, but it was one of the more relaxed, educational and inspiring wine events I’ve attended in a long time. As if an impromptu museum tasting and wine festival were not enough, we realized we could not leave Porto without visiting at least one of the port houses on the “other” side of the Douro river (located in an area called Gaia). 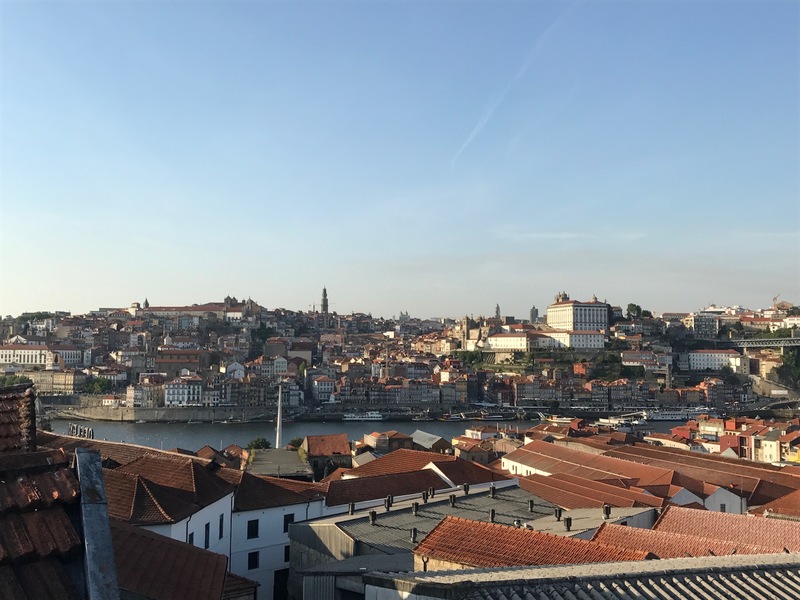 The area is not as old or architecturally impressive as the “Porto side,” but it is home to 10-15 large port houses that bottle, store, and taste all the delicious wine brought in from their Douro Valley vineyards. 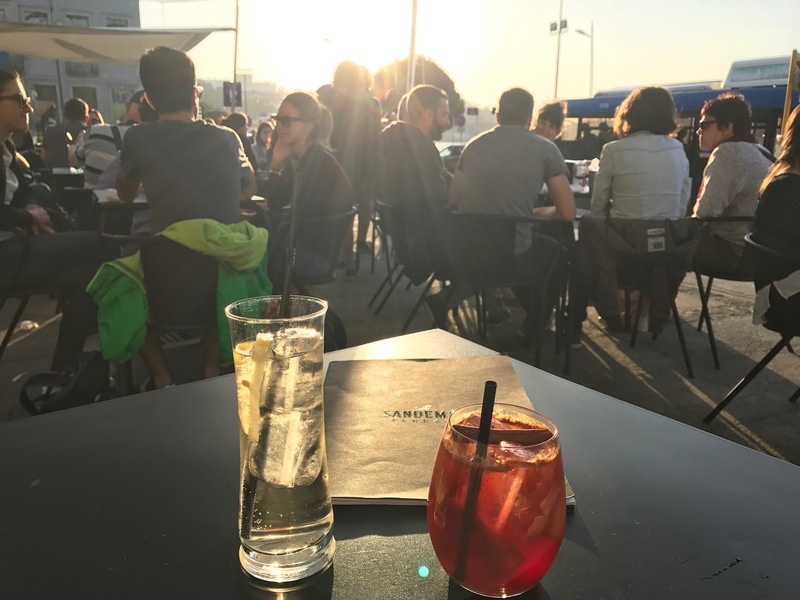 We visited Taylor’s, founded in 1692 and perched on the upper slopes of Gaia’s neighborhoods, where we enjoyed both delicious ports and expansive views of the city. We sipped our tawnies and rubies at a picnic table surrounded by hedges, fig trees, rose and lavender bushes and honeysuckle vines, and listened to the birds and many French visitors conversing happily around us. While we lacked the time to visit any other houses, we indulged in the latest aperitif trend at Sandeman’s river-front cafe (one of the largest port producers in the world) and had a couple port cocktails (what? Port and tonic? Port and prosecco? Yes, please…) down by the water’s edge as we watched the sun sink below a tree-and-house covered hill down river. *More about the Wine Institute and its role in the world of port production in the upcoming Douro Valley post!